A High Level Summary - Total housing inventory is up 5.8% month-over-month and the annual total is up 2.3% year-over-year. This is the first such increase since inventory began its slump in 2014. Unsold inventory is currently a 2.2 month supply of single-family homes. Sold homes stayed on the market an average of 26 days in July. Of these homes, 73% were on the market for less than a month. Now lets dig a deeper into July's statistics. In Q2 of this year the median price for single family homes soared to an all-time high of $898,000. This is up 5.6% year-over-year and surpassed last year's Q4 $857,667 as the new peak in our market. Despite this, a strange thing has been has happened. 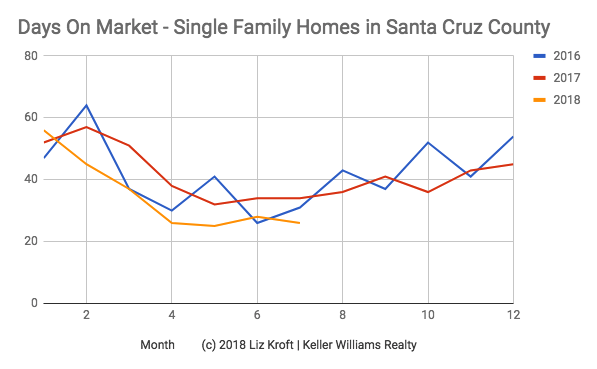 Three out of the last four months the median price of single-family homes dipped in comparison to the prior month. On a graph it doesn't look impressive, but it is significant. Is home price growth finally starting to cool? It looks like it may be. Now keep in mind, home prices are still increasing, just perhaps not quite as rapidly as they were before (this means appreciation is still occurring, just at a slower pace). May is usually one of the strongest months of the year for home price growth. This year, however, saw negative numbers at 4% below than April's median. But home prices increased 10.7% year-over-year in July. Even with these modest dips, affordability continues to worsen as home prices remain at all time highs and mortgages rates continue to climb faster than wages. As mortgage rates trend higher and higher, effects of price growth are being felt even more. Additional inventory may help balance things out (we'll get to that in a moment). 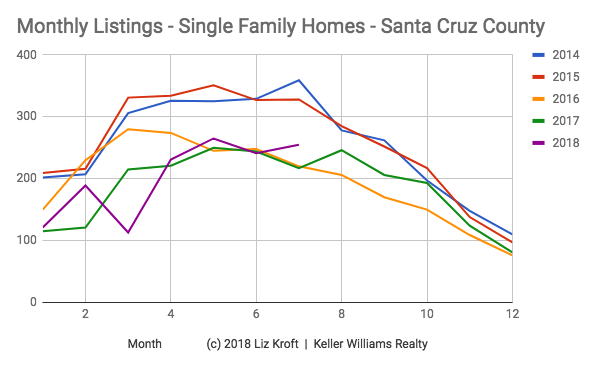 The good news for buyers: the rate at which home prices are rising, year-over-year and month-over-month, seems to have somewhat stabilized, for now. The bad news: homes are not getting substantially cheaper any time soon. Is The Inventory Drought Easing? Existing single-family homes for sale in July rose 5.8% month-over-month with 255 homes listed for sale in July. This is 17.5% more homes compared to July 2017. Hooray! When we compare this year's total listings of 1415 (January 1st through July 31st) it is 2.3% higher than the same period in 2017. Not a monumental gain, but it is some improvement. This bump in inventory is not affecting the time it takes for homes to sell though. On average, properties went into contract within 26 days in July, and 73% of the 182 homes that sold accepted offers in less than a month. This is indeed speedy. It is important to note that despite the modest rise in inventory, the current level is far from what is needed to satisfy levels of demand. We have yet to see if this modest increase will stick, given that the economy is bringing more interested buyers into the market, rising mortgage rates are forcing would-be buyers off the fence and new home construction is failing to keep pace. Food For Thought: As changes in rent control and just cause eviction loom many property owners are considering and beginning to sell their investment properties. There could be a light at the end of the tunnel, however, temporary, as prices temper and inventory creeps up. Interest rates have been on the rise for some time now, and while the Federal Reserve did not increase rates in its July-August meeting, many expect that rates will be raised two more times by the end of the this year. At the same time, inventory is still extremely tight which is driving home prices up and putting a chill on many buyers' opinions of the housing market - perhaps a factor in the cooling prices we've seen in April, May and July. Long story long, homebuyers need some more positive news - interest rates to stop rising, more inventory, relief from rising home prices or a significant wage increase, maybe all four - in order to turn the tide on these home buying blues. Maybe those changes are around the corner if the market is indeed in the early stages of a shift.